Originally, I'm pretty sure this evolved from a clipping out of a Florida newspaper or magazine. Whatever its origination, Mrs. Yi's late mother, who lived in Oak Hill, Florida, had a hand-written version she used for what became a favorite family dish. Several weeks ago, Mrs. Yi tried to recreate it as best she could from memory, adding a few of her own touches. To my palate, the result topped her mom's version, which I'd enjoyed many times. It is Greek influenced by Floridian, or vice versa. 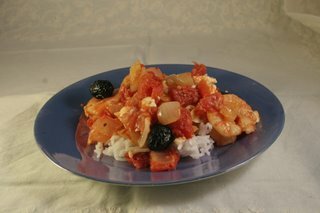 Regardless, the use of shrimp and feta as primary ingredients is a popular concept, especially in Florida. Virginia Elverson's Gulf Coast Cooking has two such recipes both from Florida. One is from the Tarpon Springs area, where for a sizable Greek population, recipes similar to this are a staple. I've never been there to sample how they do it, but cannot imagine their doing it any better than this. Preheat oven to 375 degrees. Saute shallots in butter for 2 minutes. Add shrimp and saute for 2 minutes. Transfer to casserole. Add vermouth to pan along with seeded chopped tomatoes, capers, and mustard. Simmer 5 minutes until vermouth is reduced and tomatoes are soft. Remove from heat, add thyme, and pour over shrimp. Season with pepper. Sprinkle with olives and crumble on feta, having kept it at room temperature first for 15 minutes. Then bake casserole in preheated oven for 15 minutes or until sauce is bubbly.